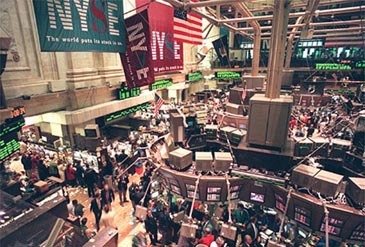 New York stocks took a steep dive on Oct.19, 2007 — the 20th anniversary of the Black Monday stock market crash, weighed down by growing worries about a possible U.S. economic slowdown due to record-breaking surges of oil prices and the dollar's depreciation against other major currencies. The Dow Jones Industrial Average of 30 blue-chip issues plummeted 366.94 points, or 2.64 percent, from the previous day to 13,522.02, marking its third sharpest tumble for this year. As a result, the Dow finished at its lowest level in about a month after five consecutive days of losses. The tech-heavy Nasdaq Composite Index closed down 74.15 points, or 2.65 percent, at 2,725.16. Selling exceeded buying in early trading after the releases of lower-than-expected business results from major U.S. banks. The lackluster performances of financial institutions stemming largely from subprime mortgage problems could weigh on the equity market for the time being, a U.S. asset-management firm said. The Dow accelerated its downward pace in the afternoon following the downgrades of mortgage-linked financial products by a rating agency, combined with record-breaking surges in oil prices, as those factors indicate bleaker prospects for corporate earnings.